Enhanced unbiased sampling of protein dynamics using evolutionary coupling information. Zahra Shamsi*, Alexander S. Moffett* and Diwakar Shukla. * indicates co-first author. One of the major challenges in atomistic simulations of proteins is efficient sampling of pathways associated with rare conformational transitions. Recent developments in statistical methods for computation of direct evolutionary couplings between amino acids within and across polypeptide chains have allowed for inference of native residue contacts, informing accurate prediction of protein folds and multimeric structures. In this study, we assess the use of distances between evolutionarily coupled residues as natural choices for reaction coordinates which can be incorporated into Markov state model-based adaptive sampling schemes and potentially used to predict not only functional conformations but also pathways of conformational change, protein folding, and protein-protein association. 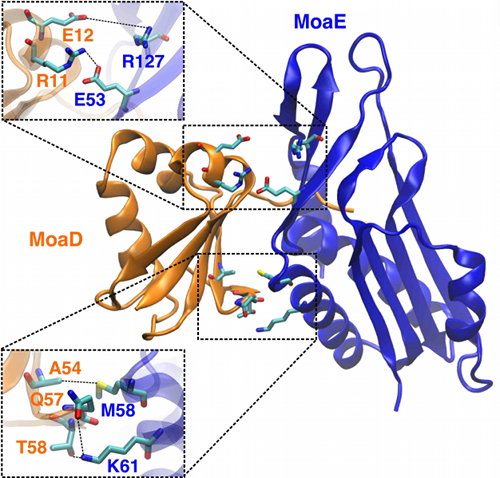 We demonstrate the utility of evolutionary couplings in sampling and predicting activation pathways of the β2-adrenergic receptor (β2-AR), folding of the WW domain, and dimerization of the E. coli molybdopterin synthase subunits. We find that the time required for β2-AR activation and folding of WW domain are greatly diminished using evolutionary couplings-guided adaptive sampling, while identifying putative association pathways and near-crystal structure complexes from protein-protein association simulations.